We are really excited with Google's Expedition updates. A few months ago Google implemented Augmented Reality "Expeditions" to the application. Now, the Silicon Valley giant, allows you to guide your students to the expeditions that you have created using external tools. This is actually huge news. The potential that this option unleashes are extraordinary since Expeditions finally becomes open to the public. You don't have to choose an expedition from the existing database if you don't see fit. From now on you can import your Expedition as well. Customized lessons are now a reality. • A selection of top Expeditions tours translated into 10 languages: Arabic, French, German, Hindi, Italian, Japanese, Korean, Portuguese, Russian, and Spanish. Stay tuned for Expeditions updates here, at the official blog of the app. 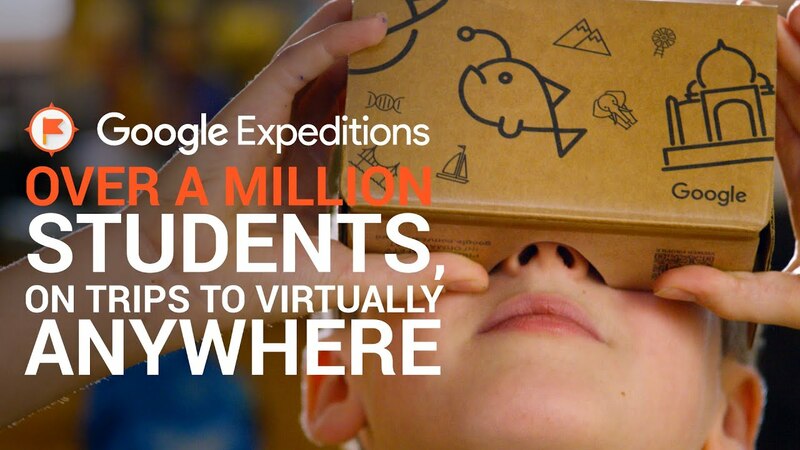 Google Expeditions is a virtual-reality teaching tool. It gives students an opportunity to explore a variety of amazing environments and areas that they may never have the chance to visit in person. You can swim with sharks, visit outer space, walk through a museum, and more without leaving the classroom. There are over 500 Expeditions trips available at the moment. Everything from the Great Wall of China, to the Buckingham Palace, and even the outer space are available as destinations for your students. Each Expedition is a 360-degree experience that allows students travel to an amazing place while being guided by a teacher. To join an expedition, each participant needs a Wi-Fi-connected tablet or smartphone. Teachers choose the content that they want to show to the devices connected on the same Wi-Fi network and can pause, play, or change what students see. Virtual reality provides an interactive, immersive experience. Instead of sitting passively, students stand up. Instead of looking at one aspect of an image, they literally turn their heads and move their eyes to view angles of a scenery. Instead of remaining aware of their classroom environment, they are immersed inside of a virtual reality setting. How to use in classroom? Teachers can use Expeditions to supplement their current curriculum with VR field trips. The teacher’s role is to ask questions, pinpoint important things on the tour, etc. Giving time for students to explore each scene first and then highlighting points of interest can help enliven the content for your students. It is also worth mentioning that extensive support materials are provided for each scene, such as leveled questions and pre-determined points of interest. The teacher guides his students through the use of a tablet he is handling. The role of the teacher is to provide the students with the necessary information regarding the scene they are watching while still being in charge of changing the scenes. It should be time-saving and problem-solving if each expedition has already been downloaded before the lesson's begging. A mobile phone between 4,5 - 5.99" with a gyroscopic sensor must be placed in every single cardboard. It doesn't have to big something fancy. As long as it possess a gyroscopic sensor it will get the job done. Each device needs to pre-install the Google Expeditions app, which is free and can be downloaded to the mobile phone via the Playstore or iOS. The HMD is the device that will host the smartphone allowing the viewing of the 3D scenes that it generates. There is a huge variety of HMDs out in the market ranging for a few dollars to hundreds of dollars. A solid option is the official Google Cardboard that can be bought from the official Google stores online and cost around 20 dollars. Despite its disadvantages (mainly in relation to the degree of limited immersion and the dizziness that can be caused to the user because of the prolonged use), the device seems to be an opportunity to integrate VR into the classroom's setting given the wide spread of smart phones and its positive elements. It is certainly a tool that would help boosting the students’ engagement while at the same time helping them gain a better understanding of the lesson.